Scuttlebutt Fuzz: Bali Day 5: "One Dollar! You buy only from me! You promised." Bali Day 5: "One Dollar! You buy only from me! You promised." Let me just say, today, I came the closest I have ever come to wanting to backhand a little kid. Today we took a long drive up to one of the most important temples in Bali, Besakih. It was raining. When we got out of the bus, were were beseiged by 20 little girls holding umbrellas. The tour company had big golf sized umbrellas that we could double up under and some of the ladies had brought their own umbrellas (duh, what a good idea to bring when you are in a rain forest). The woman I shared an umbrella with mad the mistake of asking, "How much?" I'm not kidding you, 20 umbrellas in a rainbow of colors were shoved up into our faces. We were surrounded. I think I grabbed the lady and pushed her and me through the throng of umbrella wielding waifs and repeated, "No, No, No!" quite firmly. Next, our group acquired the little girls pictured above. They were selling postcards. We said "No" I don't know how many times yet they kept following us. "You want postcards lady? One dollar." Our tour leader told the little girls to go away (there were like 10-15 of them) but they stuck to us like flies to rotting meat. Our tour leader told them we'd buy post cards from them after the worship ceremony. "You promise?" one little girl asked. "Yes, I promise. Now, be quiet and go away," the tour leader replied. "You buy only from me?" "Yes, we'll buy only from you." "Yes, I promise. Now go away." 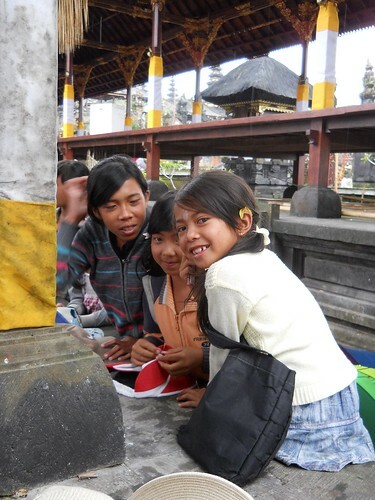 Despite other tourists entering the temple, the children did not go to them. Maybe we Americans were bleeding fish and these little girls were hungry sharks in some other cosmic dimension. After it was all over, a couple of the ladies bought post cards. That just caused more children to approach. The annoying thing was the really little kids, like the ones that looked like they were about 3 years old. When you told them "No", they started to cry and whine, "One dollar lady, you buy postcards from me. One dollar." Some where, I have become hardened. Maybe its the beggers on the streets here in DC who end up making $60-70,000 dollars a year pan handling. At least the professional pan handlers in DC dress the part. As you can see from the picture, these little girls are dressed quite well. They would blend into any 2nd or 3rd grade class in the US. They look well fed and clean. But they were sharks, I'm telling you. They wanted me to pay them money for the picture I took of them. "No, you pay me, I took the picture."